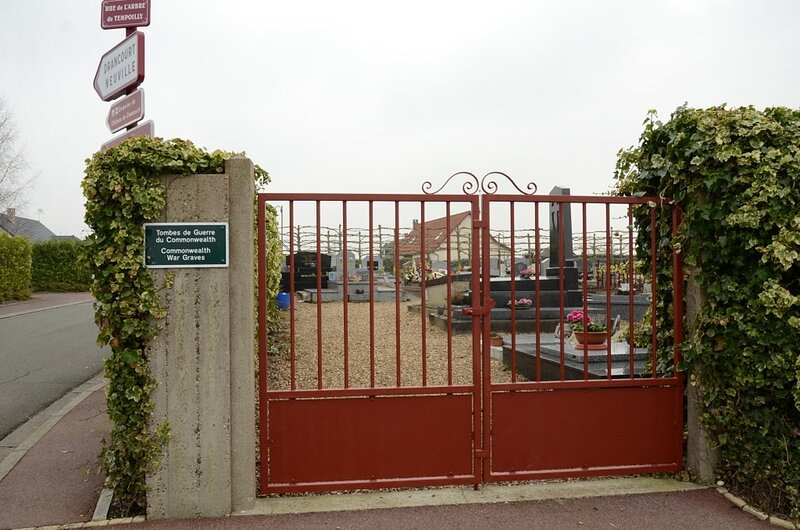 Estréboeuf is a village about 16 kilometres west-north-west of Abbeville and approximately 5 kilometres south of St Valery-sur-Somme. 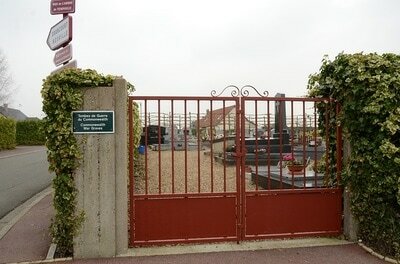 The Communal Cemetery is on the south-eastern side of the village on the road to Arrest. The casualties who are buried here were members of the crews of three tanks knocked out in an action at Boismont, which adjoins Estréboeuf on the east, during the retreat to Dunkirk in May 1940. 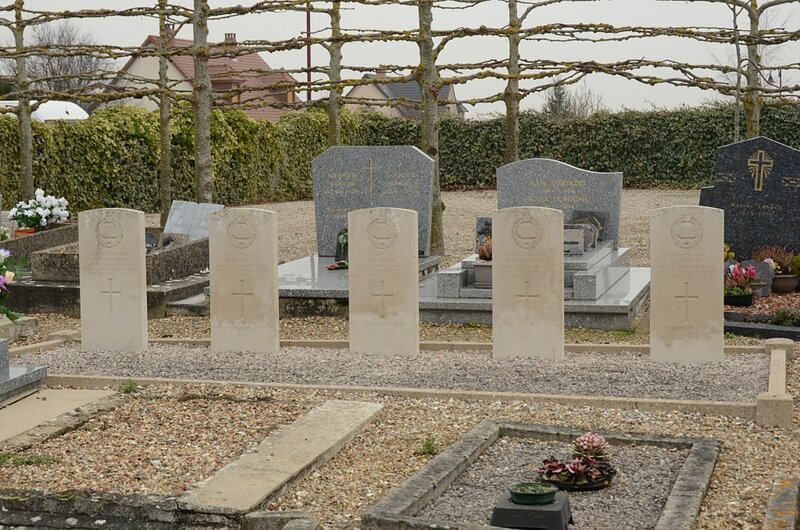 They were buried originally in a field at the scene of the action, but later the German occupation authorities permitted the people to Estreboeuf to transfer the remains to the local cemetery. 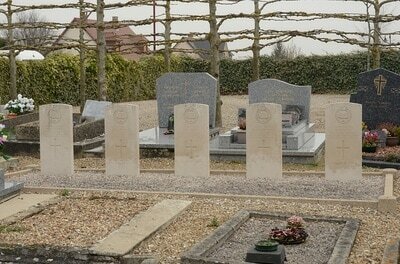 Their graves are near the middle of the southern boundary. 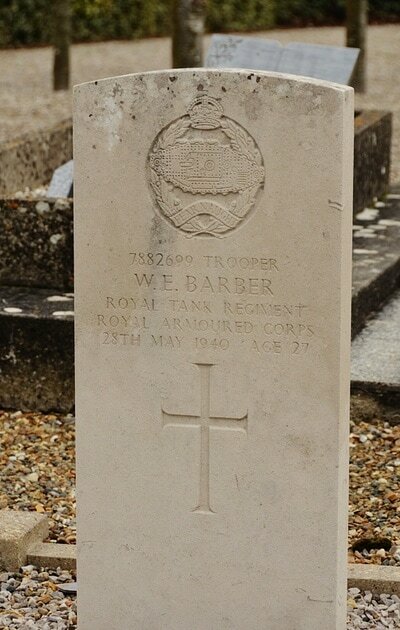 7882699 Trooper William Elijah Barber, 5th Royal Tank Regiment. R. A. C., died 28th May 1940, aged 27. 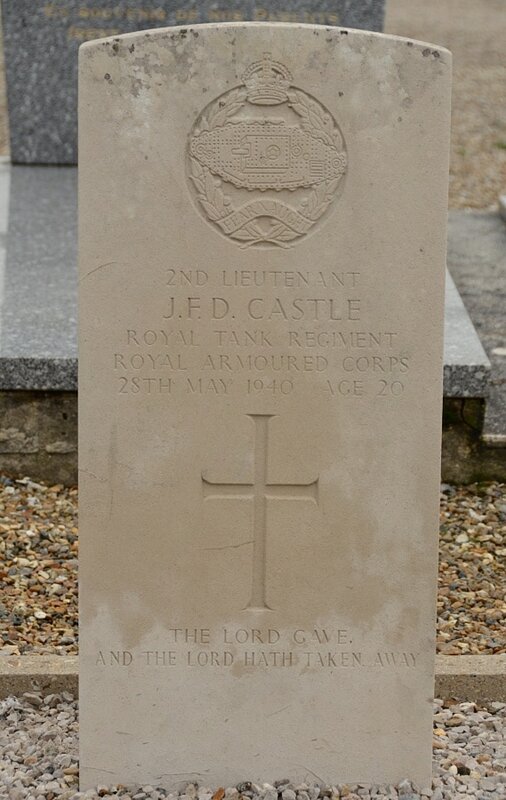 95560 Second Lieutenant John Frederick Dixon Castle, 5th Royal Tank Regiment. 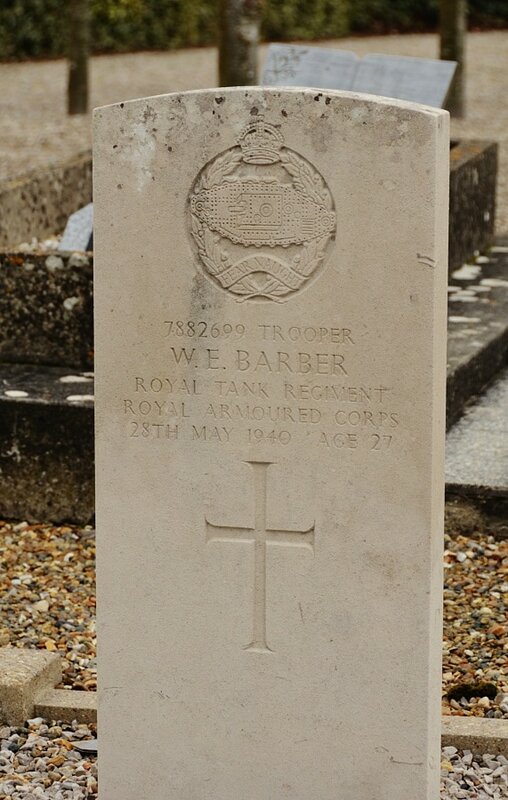 R. A. C., died 28th May 1940, aged 20. Son of Frederick William and Florence Isobel Castle, of Blackmans Bay, Tasmania. 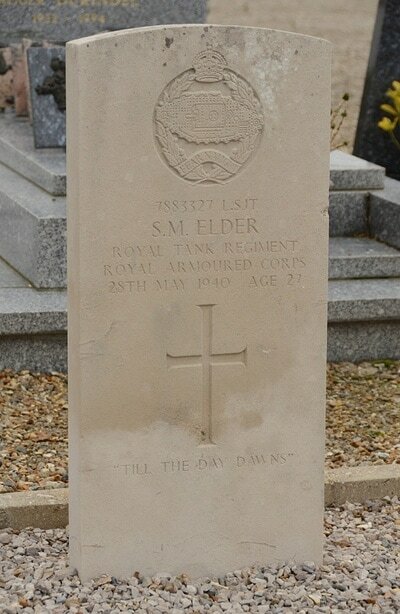 7883327 Lance Serjeant Scott Montgomery Elder, 5th Royal Tank Regiment. R. A. C., died 28th May 1940, aged 27. Son of Alexander and Jessie Elder, of Roslin, Midlothian. 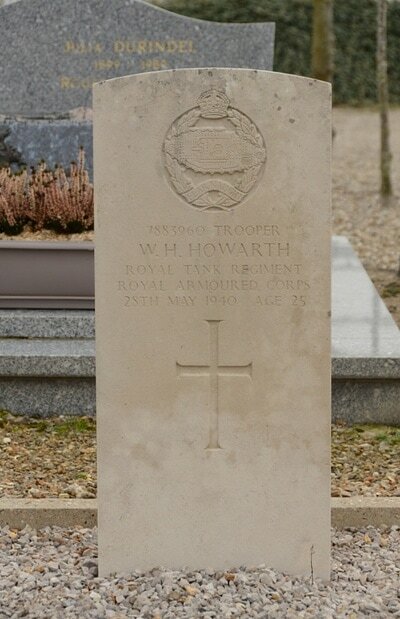 7883960 Trooper William Henry Howarth, 5th Royal Tank Regiment. R. A. C., died 28th May 1940, aged 25. 7884159 Trooper Michael Hunter, 5th Royal Tank Regiment. R. A. C., died 28th May 1940, aged 25. 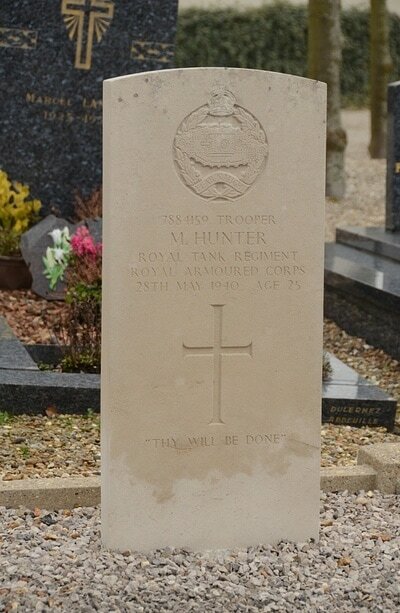 Son of Michael and Mary Hunter, of Bainsford, Falkirk, Stirlingshire.